You have added Rare Treasures Embellished Chiffon Designer Dress in Green into shopping cart. This strapless chiffon designer dress would make a cute bridesmaid dress or just an adorable party dress to wear to any event. 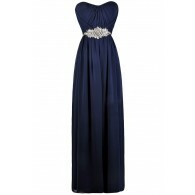 The Rare Treasures Embellished Chiffon Designer Dress is fully lined and made of chiffon. It has a strapless sweetheart neckline and lined and lightly padded bust. Pleated chiffon makes up the bust of this dress while the attached skirt has a classic flowy cut. The best part of this dress has to be the embellished waistband decorated with alternating pearls and rhinestones. A hidden back zipper completes this dress. The Rare Treasures Embellished Chiffon Designer Dress would look great paired with pumps or strappy heels. Details: Fully lined. Lightly padded bust. Hidden back zipper. 100% polyester. Lining: 95% polyester, 5% spandex. Dry clean only. Small measurements: Length from top of bust to hemline: 28". Bust: 32". You have added Rare Treasures Embellished Chiffon Designer Dress in Green into Wishlist. You have added Rare Treasures Embellished Chiffon Designer Dress in Green for Stock Notification. You have set Rare Treasures Embellished Chiffon Designer Dress in Green as a loved product. You have removed Rare Treasures Embellished Chiffon Designer Dress in Green as a loved product.